We are huge fans of Brodit mounts here at PocketGPSWorld.com and don't try to hide it! Take a peek inside the cars of any of the team or moderators and the chances are you will find a Brodit Cradle and ProClip. Why? Well quite apart from hating the windscreen suction mounts that manufacturers supply, they offer the best solution available for mounting a PDA or PND in your car in a secure and easy to use cradle. Indeed Brodit offer cradles for many more applications such as MP3 players, 2-Way radios to name a few. Coupled with the correct ProClip which is a vehicle specific dash mount solution, a Brodit installation offers a 'No Holes' fitting that looks like an OEM product. Here we are reviewing the recently released 'Active' Mount for TomTom's x20 range which includes the GO 520 and 720 and will also include the soon to be released TomTom 920. Our thanks go to DSLDevelopments the UK Retailer of Brodit Mounting Solutions for supplying the review mount. Thanks Andy, the ftp was stalled. It's a good solution. I'm in contact with Brodit about the possibility of adding support for the TMC Antenna so that it can be attached to the mount if desired. I'm in contact with Brodit about the possibility of adding support for the TMC Antenna so that it can be attached to the mount if desired. Extremely good point. I'm not interested in getting an active mount if you then have to add the TMC line in seperately each time you take the PND in/out of it's cradle. Brodit have passed this to their R&D Team who are looking into this. TBH I hate the extra wire that you have to have with the FM TMC so rarely use it but it should be possible. I reckon a drop of Araldite on the TMC plug when the GO is docked would be sufficient to secure it to the side of the mount. Darren - I hope with that mounting location that you don't have any curtain airbags! The last thing I'd want in a minor crash is a satnav being shoved into my face at over 300MPH. I've had the unfortunate experience of being in a head-on collision and believe me, being hit by an airbag is painful enough already without a TomTom coming into the equation! A good point but no, nothing as advanced as curtain or A/B Pillar airbags in my Discovery. If there were I wouldn't have used such a mount nor I suspect would Brodit have made one! If they can put the TMC connector on the mount that would be excellent! I'd buy one!! One other question - would it be a good idea to make the mount so you could disconnect the cables from the mount? At the moment (by the looks of it) to remove the mount you'd also need to remove the curly cable thats supplied...now if you have that neatly tucked away you wouldn't want to keep removing it would you?! I don't like the look of any of the pro clip solutions for my car, my last tomtom was navigator running on a dell axim with the tomtom pda mount. I notice the brodit has 4 screws onto a square place, which looks similar to my olf tomtom one. Is this a standard? Will it fit? If it does I'll buy one. If so, I believe Brodit do an adapter to convert their cradles to connect to that fitment. It's a good point but these are intended to be more 'fitted' solutions. Mine is fitted with the cable routed behind the dash so it does present an issue but I don't know how they could make the cable removable easily without compromising the active design? If I want to hide mine I remove the cradle off the Move Clip and tuck it under the dash. ...If you have the wedge mount-things! I suppose I'm trying to conceal all evidence of having a cradle in there when I'm away from the car in a public place. Suppose hiding it under the dash is a compromise! 2. 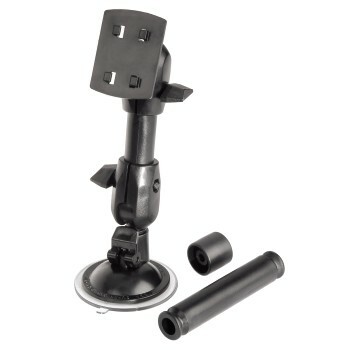 The new TMC receivers have a very short connecting cable which does not work well with mounts that are not windscreen based such as this Brodit mount. If Brodit can incorporate the TMC connector along with an extension cable this will be perfect. If this happens it would be nice if Brodit offered customers like me an option to upgrade in some way? In the past Brodit have designed a clamp system that takes the OEM cable, maybe that would be suitable here? That's the case with mine, when connected the 'dongle bit doesn't reach the screen and hangs in mid-air. That would be the ideal solution, I don't think Brodit would have a problem sourcing the correct connector. I'll point them to this thread. The connector has four poles on the center pin and two additional contacts are on the inside of the barrel as two rings (you can just make these out if you hold it at an angle).